We are proud to offer for sale this modern villa located in a secure gated complex of just seven, all owner occupied. Built to exacting standards by our fastidious owners the presentation is first class, and the location offers a convenient lifestyle suitable for empty nesters, and/or young professionals. -	Expansive tiled lounge and dining room filled with light courtesy of the 5.5m high pitched ceiling featuring louver windows fitted with remote controlled blinds. -	Elegant and impressive chef's kitchen with ample storage space including glass door display cabinets, pantry and broom cupboard. Appliances include an Omega 5 burner gas cooktop, electric oven and Bosch dishwasher, finished with stone waterfall benchtops and glass splashback. -	Generous master bedroom with ceiling fan, walk-in robe and fully tiled ensuite fitted with shaving cabinet, heated towel rail, and ceiling heater/fan. -	2 other spacious carpeted bedrooms with ceiling fans and floor to ceiling mirror door built-in robes. -	Renovated main bathroom with extra-long and deep bath/shower with frameless safety 10mm glass and ceiling heater/fan. -	Entertainers will be delighted with the 18sqm tiled patio covered by a pitched pergola, with retractable fan/light and dual strip lighting with 3 open sides fitted with quality see-through rain-proof roller blinds. -	The low maintenance yard hosts a 5 person spa, with recently replaced cover and tucked away at the side of the home is a rainwater storage tank (approx 2,000 litres). -	Double garage with remote controlled door and internal access with a generous floor to ceiling storage room fitted with shelving. -	Fully ducted air conditioning, audible intrusion alarm, Crimsafe grills fitted to all external doors, master bedroom and main bathroom, and NBN connection. -	High 2900mm ceilings throughout with three step cornices to the living areas and plantation shutters throughout. Freshly painted inside and out. -	Easy care gardens with no grass and a direct access gate to your private courtyard. -	Fantastic location, walking distance to Gilroy College and Excelsior Public School. 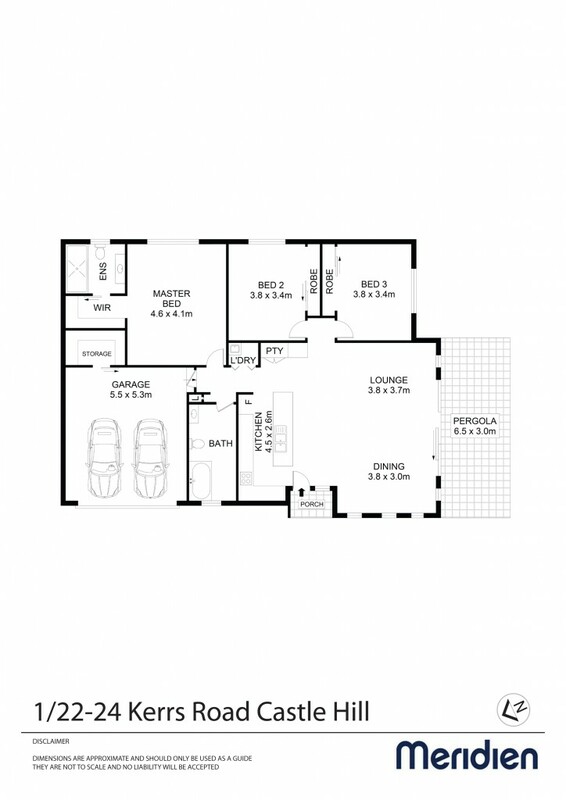 -	A level walk to bus transport to the CBD, Parramatta and Rouse Hill just 350 meters away. -	Strategically positioned to allow easy access to the North West Rail Link, via either Castle Hill Station or Showground Station. The immaculate presentation is bound to impress, and the location, close to all amenities including Castle Towers Shopping Centre, medical and dental facilities, cafes, restaurants and cinemas will be embraced.